Jupiter's fifth moon, Io, is the most volcanically active body in the solar system. Plumes of sulfur spew upward as high as 190 miles (300 kilometers). The surface of Io is splotched with lava lakes and floodplains of liquid rock. Age: Io is about 4.5 billion years old, about the same age as Jupiter. 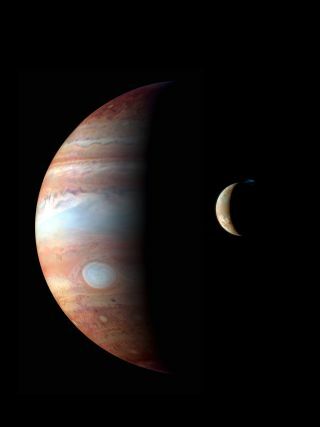 Distance from Jupiter: Io is the fifth moon from Jupiter. Its average orbital distance is about 262,000 miles (422,000 km). Io takes 1.77 Earth-days to orbit Jupiter. Io is tidally locked, so the same side always faces Jupiter. Size: Io has a mean radius of 1,131.7 miles, making it slightly larger than Earth's moon. It has a slight elliptical shape, with its longest axis directed toward Jupiter. Among the Galilean satellites Io ranks third, behind Ganymede and Callisto but ahead of Europa, in both mass and volume. Temperature: Io's surface temperature averages about minus 202 degrees Fahrenheit (minus 130 Celsius), resulting in the formation of sulfur dioxide snowfields. But Io's volcanoes can reach 3,000 F (1,649 C). Io is often referred to as a celestial body of fire and ice. Artist's concept of the internal structure of Jupiter's moon Io. A global magma "ocean" (shown in orange) lies beneath a crust 30 to 50 kilometers thick. The rest of Io's mantle is shown in gold, while the moon's core is rendered in silver. Io was the first of Jupiter’s moons discovered by Galileo Galilei on Jan. 8, 1610. He actually discovered the moon the day prior, but could not differentiate between Io and Europa, another Jupiter moon, until the next night. The discovery, along with three other Jovian moons, was the first time a moon was discovered orbiting a planet other than Earth. Galileo's discovery eventually led to the understanding that planets orbit the sun, instead of our solar system revolving around Earth. Galileo first referred to this moon as Jupiter I. In the mid-1800s, the moon was renamed Io. In Greek mythology, Io was a priestess of Hera (Zeus' wife) and the daughter of Inachus, the king of Argos. Zeus (the counterpart for the Roman god Jupiter) fell in love with her, but turned her into a cow to avoid being caught with her by his wife, Hera (or Juno). Hubble Space Telescope ultraviolet image of the northern pole of Jupiter. Among many other auroral structures, the Io footprint is the most equator-ward feature close to the centre of the image. This spot is always located close to the feet of the magnetic field lines connected to the satellite Io. The interior of Io is composed of an iron or iron sulfide core and a brown silicate outer layer, giving the planet a splotchy orange, yellow, black, red, and white appearance. Based on data from scientific computer models, Io formed in a region around Jupiter where water ice was plentiful. Io's heat, combined with the possibility that there was water on Io shortly after it was formed, could have made life possible, although Jupiter's radiation would have removed the water from the surface. The moon's most distinctive features are its volcanoes. Aside from Earth, Io is the only known body in the solar system to have observed active volcanoes. While Galileo had made some cryptic notes inferring possible volcanic activity, NASA's Voyager spacecraft discovered Io's volcanoes in 1979. The volcanic activity is a result of Io being stretched and squeezed as it orbits Jupiter. Io's rock surface bulges up and down by as much as 100 meters (328 feet) during the process. This affects Io's volcanic activity in a similar way to which Earth's oceans react to the moon. Io's irregularly elliptical orbit also heightens the tidal activity. Researchers are interested in watching the long-term activity of Io, which used to be difficult because telescopes on Earth lacked the resolution to look at hotspots. However, using the adaptive optics systems of two of the world's largest telescopes, astronomers were able to cancel out 6 the wavy effects of our atmosphere, allowing more close looks at the moon's active volcanoes. They tracked 48 hotspots from 2013 through 2015. Earth-based observations have also looked shown waves in lava lakess, providing more detail about how magma cycles on Io's surface. Because of the volcanic activity, Io's atmosphere contains mostly sulphur dioxide. Io's orbit cuts across Jupiter's powerful magnetic lines of force, turning Io into an electric generator. As Jupiter rotates, the magnetic forces strip away about a ton of Io's material every second. The material becomes ionized and forms a doughnut-shaped cloud of radiation called a plasma torus. Some of the ions are pulled into Jupiter's upper atmosphere and create auroras. An example of this activity was spotted by the Hubble Space Telescope, which revealed the influences of Io and another Jovian moon, Ganymede, in Jupiter's auroras in 2018. Io also has a collapsible atmosphere, according to observations from the Gemini North telescope in Hawaii and the Texas Echelon Cross Echelle Spectrograph (TEXES) released in 2018. The sulfur dioxide envelope of gas freezes up while Io is in the shadow of Jupiter every day. When Io comes back into sunlight, the freezing sulfur dioxide converts to gas once more. Scientists long suspected this phenomenon exists, but it was only after this new study — which saw Io's atmosphere in the dark for the first time — that researchers confirmed it. Io's environment has come under intense scrutiny in recent years as scientists try to explain why the moon has the most active volcanoes in the solar system. The recent findings involve both observations of the moon and modeling of the interior, which can only be inferred. A 2015 study explained why Io's most prolific volcanoes appear to be offset from where scientists expected they would be. While previous models suggested that the zones with the most intense heating would have more active volcanoes, the actual Io had its most active ones farther east. The study suggests that if there was an ocean mixed with molten and solid rock underneath the moon, the rock portions would rub against each other and create the offset zones scientists observed. However, the existence of a molten ocean came into doubt with a 2017 study, which showed that some auroras we can see in Io's atmosphere would have been damped out by an underground ocean. In other words, we can only see the auroras because the moon likely has no molten ocean, the study concluded. Insights into Io's surface may also come from a 2012 map published by the U.S. Geological Survey — the first to include the entire surface. The researchers said that volcanic activity would be among the things that could be studied with this map. The imagery includes observations from the Voyager 1 and Voyager 2 spacecraft, as well as Galileo. While there is no mission specifically planned to look at Io, other missions are now in the vicinity of the moon — such as the aforementioned Juno spacecraft — or will be in future years. In the 2020s, dNASA's Europa Clipper mission will investigate the habitability of another Galilean moon, Europa. The European Space Agency's JUICE mission (JUpiter ICy Moons Explorer), set to launch in 2022, will focus on Europa, Ganymede and Callisto. Meanwhile, observations continue from the ground; sometimes Io's volcanoes are violent enough to produce spectacular pictures even from so far away. This map, released in March 2012 by the U.S. Geological Survey, is the first ever to chart the Jupiter moon Io's geology on a global scale. Io is the most volcanically active object in the solar system.